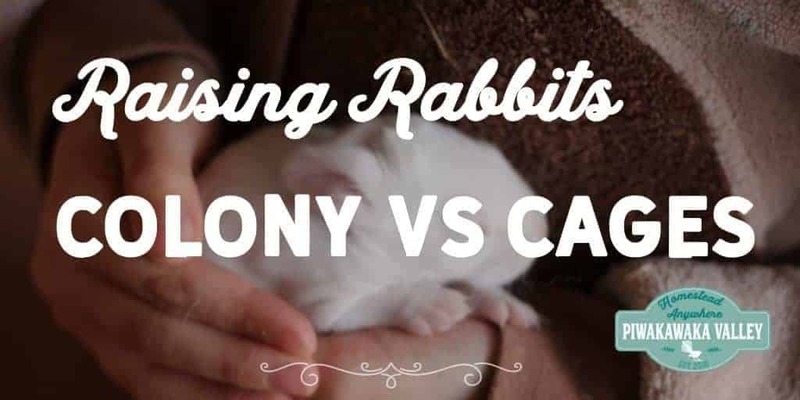 Colony vs Cage Rabbits | What is the best way to raise rabbits? Colony Rabbits vs Cage Rabbits | What is the best way to raise rabbits? There is a debate going on in the bunny world – colony rabbits vs cages – What is the best way to raise rabbits? A growing movement of people are choosing to raise their rabbits in a colony setting. A rabbit colony is simply group housing for rabbits. You may keep lots of rabbits together in one house, or choose to just keep them in bonded pairs or small groups. The rabbits that we keep as pets are descended from the European wild rabbit. They are different to the cotton tails that live wild in America, but are the same as the wild rabbits that live in Australia and New Zealand. European rabbits are naturally social animals. They live in small family groups in the wild, and when given the chance, will do so in captivity also. American cotton tails are more solitary in nature. Bucks will keep a small harem of does, and if your colony has enough space and feed/water stations, you can keep several bucks and many does in together. If there is not enough space or resource to go around, bucks will fight, sometimes to the death, but more often to quite severe injury including castration and eye injuries. Want to know all about raising rabbits in a colony? Does can be mean to new comers too. To minimize fighting you should provide many obstacles to provide places to hide, and break the line of sight over the whole pen. This gives the newbies a chance to hide from the grumpy queen. We raise our rabbits as a sustainable meat source. I understand that not everyone agrees with this, but the benefits of a colony applies to pet rabbits too. You can stack many many cages into a space. Depending on setup it can be hard to catch rabbits but feeding them daily in an area that can be closed off solves that issue. Because of our philosophy of happy animals, happy meat, we have chosen to raise our meat rabbits in a colony. We have a main shed that the breeding animals live in, and the kits stay in there until about 5 weeks of age. Then we have two grow out pens that the kits go out into until they are ready to be processed. I know many people say the kits should stay with their mother until 8 weeks, but by 4-5 weeks usually our doe has weaned them and has another litter due any day. We were finding that keeping the older kits in with the mothers was causing the mothers to make poor nesting choices for their next litters and we were loosing kits left and right. Removing the older kits allows the mothers to utilize the nesting boxes properly for their next litter. 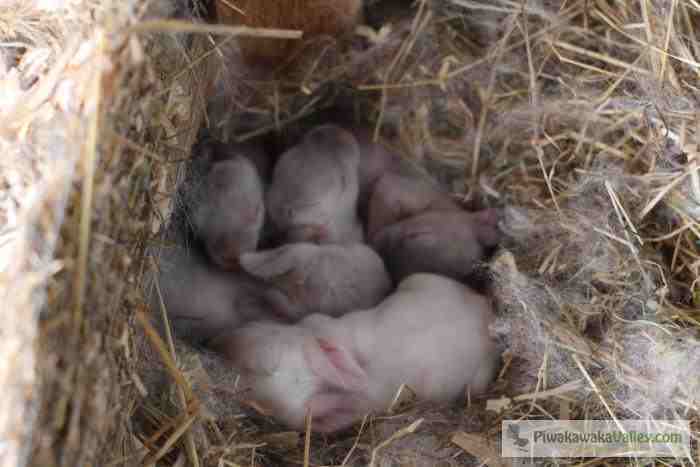 These kits were born in a cold damp spot as the bigger kits took over the nesting box. They are silver because they are chilled, they should be white. 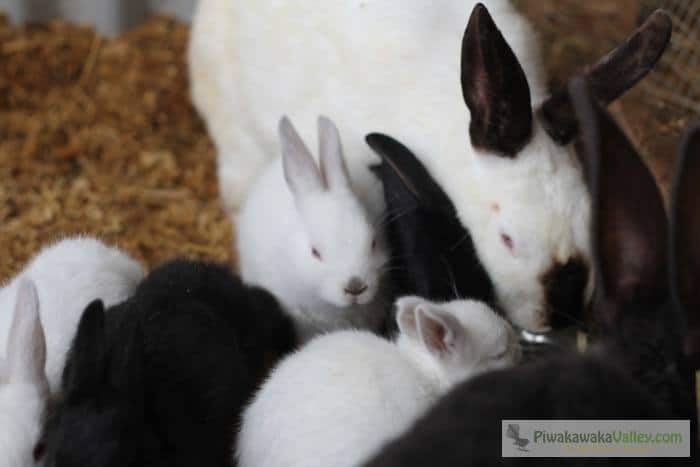 Raising meat rabbits in a colony seemed like a natural step for us, we have built a purpose built rabbit colony shed and employ the deep litter bedding method in the shed. Our buck stays in with our does year round. This means they are free to socialize, groom, run and snuggle, just how bunnies love to live. 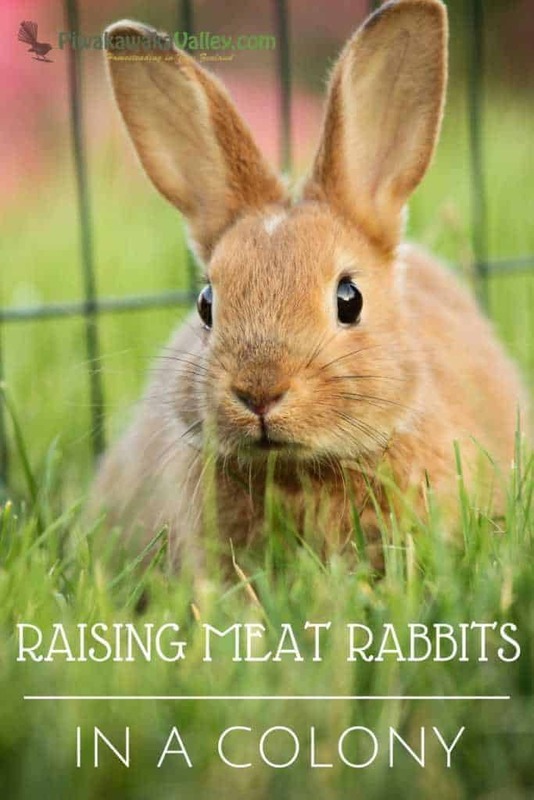 Raising Meat Rabbits in a Colony is growing in popularity with people wishing to provide their rabbits with a more natural way of life. You have heard of free range pasture fed chicken, well this is free range pasture fed rabbit. 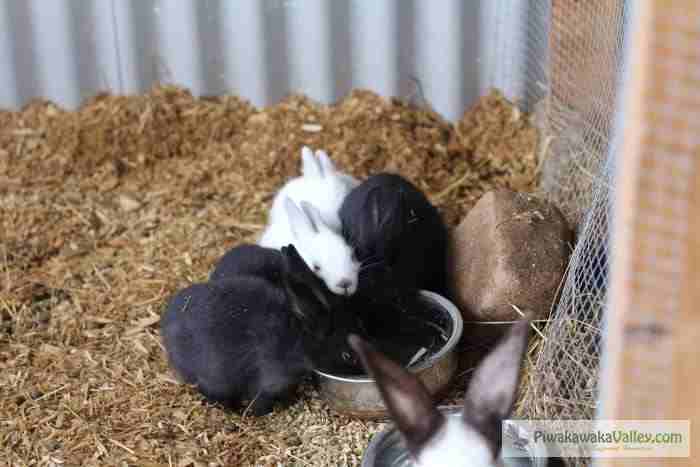 For more information about colony raising rabbits check out our section on it here. How do you keep your rabbits? Tell me about it in the comments below! How do you go about processing your rabbits? We are thinking about raising our own meat, but want to be as humane as possible. We use the “broomstick” method. But don’t use an actual broomstick it is too wide to be efficient. A piece of reinforcing steel (rebar) or we actually use a broken fire poker! Look on you tube for broomstick method, there are some great ones on there. Liked your site but your ads cover your content. Hi Janet, I understand that not everyone is OK with raising their own meat. For our family, I would rather give the animals a happy life before we gently and calmly end their lives. The other option is mass produced meat from the store. Even vegans are not let off the hook, as the number of small animals that are routinely killed by combine harvesters bringing in grain and soy is phenomenal. We feel supplying our own meat is the lesser of two evils.